There is a horrible false doctrine circulating in many churches today, which claims that God hates sinners. That is not Biblical. My friend, God loves all sinners, even you! God loves Christ-rejecters! God loves homosexuals! I marvel that any forgiven Christian would say that God hates anyone. God is love! The truth is that the Pharisee was equally as much a rotten sinner as the woman was (and so are you and me), but he didn't see his own sins. If that wicked self-righteous Pharisee had seen his own sins and recognized Jesus as the Christ, he would have joined the woman at Jesus' feet, washing the Lord's feet with his tears also, and drying the Lord's feet with his hair. If Jesus were here now in person, with much love for all that He has forgiven me of, I would fall to His feet and with much tears wash His feet. I couldn't dry His feet though with my hair, because I don't have hardly any hair left, but I would dry His feet with my shirt. Jesus is so precious!!! What a beautiful Scripture! This woman was a horrible sinner. She had earned a bad reputation around town. Everyone knew about her sins. Yet, she was forgiven in Christ and had much love because of it. My friend, if you ever realize one day how much of a horrible sinner you truly are, you will also kneel at Jesus' feet in your heart, and wash His feet with your tears and hair, and you will stop condemning others. When I hear someone saying that God hates sinners, I know that this individual has never experienced the depth of God's forgiveness. When you hear self-righteous preachers and church laymen spewing hatred toward sinners, and teaching that God hates sinners, you can know assuredly that they have never truly been confronted with their own sins. I tell you, nobody can love God who does not love sinners! The Happiest Man (MP3, Dr. Hyles; Happiest is the man who will not impute sin to others!). It's a lot easier to forgive others when you've been forgiven by God. It's a lot easier to love others when you've received God's undeserving love yourself. Habakkuk 3:2, “...in wrath remember mercy.” We deserve God's wrath, but instead He gives us mercy through Jesus Christ. You'll never truly grasp the depth of God's wondrous forgiveness, grace, mercy and love until you've horribly sinned, hitting rock bottom, and have been pardoned by Christ's cleansing blood. Jesus' blood always cleanses deeper than the stain of sin has gone! Amen! Truly, the Lord God hates sin as much as He loves the sinner, but He does love the sinner. God loves us because of WHO HE IS, not because of WHO WE ARE. If God's love was based upon our obedience, then we'd all be in big trouble. I'm not saying that God loves the act of sin; but rather, God loves people, because He created all of us. God loves all mankind. There is no one whom God does not completely and unconditionally love. God unconditionally loves the starving child in Africa whose ribs are showing, as much as he loves the potbellied Wall Street billionaire. Romans 2:11 teaches that God is not respecter of persons. It is man's sins of pride, lust, greed, covetousness and selfishness that cause all of the world's woes. The problem is not that God hasn't started loving man, but that man hasn't started loving God. To “love” (Greek: agape) others doesn't mean to associate with unrepentant sinners, pander to them, approve of their wickedness or refrain from exposing their heretical teachings; it means that you treat them the way God tells you to, which is, as you want to be treated (The Golden Rule, Matthew 7:12). It means that you look beyond their faults and see their needs. Love sees people as broken rather than bad. Love always gives the benefit of the doubt. Love is being understanding, kind, forgiving, caring, helpful and respectful. Love may also require tough love, laying down the rules, rebuking someone who is theologically off the road, getting upset, taking a stand against them, et cetera. God's unconditional love (Greek: agape) is not a feeling, nor an emotion, nor a fondness (Greek: phileo). God unconditionally loves (agape) sinners, but He is not fond (phileo) of them. So God does not love sinners in one sense of the word love (phileo), but He does love (agape) them in another sense. To say that Christ only died for the saints is to say that God only loves those who first love Him, which is totally unbiblical. The exact opposite is true, that is, God first loved us! People generally love those back who love them first. Romans 5:8 says that Christ died for us, “while we were yet sinners.” You see, God knew that we would be horrible sinners, deserving to be punished in the fires of Hell for all eternity in torment, without hope or rest day-nor-night; yet God the Father in His love sent His only begotten Son into the world, to be beaten, despised, rejected, tortured, spit upon, stripped naked and crucified on a cross for our sins. That's love buddy! God loved us first, and that absolute must include all mankind in order to be true. Genuine unconditional love (Greek: agape), which is the love of God, has nothing to do with the object of the love. It has everything to do with the lover (the giver and not the recipient). The object of God's love is man. I love my web visitors because of who I am and you cannot change that. I love my enemies because of who I am. That is God's love in me. No matter what others may do to hurt me, it doesn't change my unconditional love of God for them. This is God's love shed abroad inside my heart. I love the Holy Spirit, Who is the Godhead dwelling in me (1st Corinthians 3:15-16; Romans 8:9; 1st John 3:24). 1st John 3:24, “And he that keepeth his commandments dwelleth in him, and he in him. And hereby we know that he abideth in us, by the Spirit which he hath given us.” The Bible warns that if you don't have love for others, it may signify that you don't have God's Holy Spirit in you, and you're not really a born-again Christian. I'm not saying that God approves of sin, God forbid; nor am I saying that we ought to compromise our convictions and remain silent concerning present public wickedness (such as the vile homosexual agenda, lewdness and the murderous abortion industry). Loving the sinner does not mean embracing their sins; but rather, it means unconditionally loving them in spite of their sins. Christ sets the example for us to follow. Romans 5:8, “But God commendeth his love toward us, in that, while we were yet sinners, Christ died for us.” There is much immaturity in believers nowadays, who have been influenced adversely by the hateful newsmedia to gossip, slander and attack others. This is heathendom! Proverb:10:12, “Hatred stirreth up strifes: but love covereth all sins.” Proverb 19:11, “The discretion of a man deferreth his anger; and it is his glory to pass over a transgression.” In God's eyes, you are just as sinful as the next guy. James 2:10, “For whosoever shall keep the whole law, and yet offend in one point, he is guilty of all.” Everyone's sin will be revealed in eternity. 1st Timothy 5:24, “Some men's sins are open beforehand, going before to judgment; and some men they follow after.” We are all dirty sinners by nature and by choice. Here is a foolish man who teaches that John 3:16 is only past tense. John 3:16, “For God so loved the world, that he gave his only begotten Son, that whosoever believeth in him should not perish, but have everlasting life.” The Greek word for “loved” is aorist, meaning a past point in time. Thus, the foolish author of the preceding video claims that God only loved the world for a short duration of time past, when God sent His Son to the cross. Then the honeymoon ended? How ridiculous and absurd it is to say that God's love for the whole world in John 3:16 was only for a limited time and is over. I cannot believe all of the junk theology in our churches today. May I say, God never stops loving anybody! It was God's unconditional love that nailed Jesus Christ to the cross for your sins and mine. Amen! It was God's love that raised Christ up from the dead and compelled Him to ascend as our High Priest into Heaven. It was love that made it all happen! Once you love someone, you never stop loving them. Love is not a one time act! Let me use an illustration. Let's say that you are driving along the highway and read a traffic sign which says, “55 Miles Per Hour.” So you drive 85 MPH instead and then a state trooper pulls you over to give you a speeding citation. When the officer comes to the window of your vehicle, he politely asks if you saw that speed limit sign posted back there. You reply, “Yes Sir, I certainly did, but I thought it just meant to stay under 55 MPH at the sign only. Once I passed the sign then I speeded up.” Now, if you try that one, you know what is going to happen... you're getting a speeding citation! This is a ridiculous scenario (but I'm sure someone has tried it). Likewise, John 3:16 says, “For God so loved the world, that he gave his only begotten Son, that whosoever believeth in him should not perish, but have everlasting life.” It is unscholarly rubbish and wrestling of the Scriptures to say that God hasn't continued loving the whole world. The same wonderful God Who loved the world enough to die for it still loves it enough to be patient with all men, longsuffering toward them, that they might all come to repentance (2nd Peter 3:9). That's love buddy! The idea that God hates you until you get saved is foreign to the Word of God. God loved you before you were even conceived in your mother's womb. God loved you as a child. God loved you as a youth. God loves you as an adult. God loves you when you become elderly. God loves you in spite of the horrible sins you've done, the people you hurt, or the crimes you've committed. God hates sin, but He loves people (and all people are sinners). If you are a child of God, the Lord will chastise you as promised in (Hebrews 12:6-8). If you are not saved, God's wrath is bottling-up against you for judgment day (2nd Thessalonians 1:8-9). The Bible teaches Christians to love their enemies. Matthew 5:44, “But I say unto you, Love your enemies, bless them that curse you, do good to them that hate you, and pray for them which despitefully use you, and persecute you.” Do you think God hates His enemies? Some preachers say that God hates sinners, and that Christians should hate sinners too. This is not what the Holy Bible teaches. Luke 6:35, “But love ye your enemies, and do good, and lend, hoping for nothing again; and your reward shall be great, and ye shall be the children of the Highest: for he is kind unto the unthankful and to the evil.” If God hated sinners, then He surely would not be kind to them, especially to them that unthankful and evil. Notice in Luke 6:35 that God is kind to the unthankful and to the evil. That is unconditional love my friend. How Should I Witness to a Homosexual? Kindly, Mr. Comfort twists the truth around, misrepresenting Christians who love sinners. As a born-again Christian I love all sinners. Just as God, I hate the sin but love the sinner. As you just read, Ray Comfort quotes Evangelist Charles Finney (1792-1875), who said that God is not merely angry at a person's sin, but also with the sinful person. This is true. Psalms 7:11 says that God is angry with the wicked every day. God is not just angry about the sin, but toward the sinner also. However, by saying that God is angry against sinners, that does not mean God hates them. If God hated sinners, then He would be a very hateful God (because everyone sins); but the Bible proclaims that God is love!!! A parent can be angry at their child without hating them. A man can be angry at his neighbour without hating him. Respectfully, Ray Comfort is exaggerating. I don't know any preacher who thinks that God is pleased with adulterers (but that's what Mr. Comfort alleges in his The Evidence Bible, pg 1571). I teach that God hates sin but loves the sinner. This is Biblical. I certainly don't think that God is pleased with adulterers or thieves. God loves them as people, not as criminals. Why is that so hard to understand??? God can hate sin and be angry at the sinner, while still loving that sinner. We find Scriptural evidence of this truth in 2nd Peter 3:9, “The Lord is not slack concerning his promise, as some men count slackness; but is longsuffering to us-ward, not willing that any should perish, but that all should come to repentance.” Buddy, that's unconditional love! God is patiently, lovingly and long-sufferingly tolerating all the wickedness of the world today, simply because He desires for all men to repent and believe the Gospel to be saved. Most people won't repent, but God is lovingly waiting for them. What a good God! The door of opportunity is now open. The time to be saved is now! Please don't wait until it is too late and the opportunity to get saved is gone. When a person gets saved, the anger that God had toward them as a sinner is gone, appeased. The Bible calls this doctrine propitiation (Romans 3:25; 1st John 2:2, 4:10). Romans 5:9, “Much more then, being now justified by his blood, we shall be saved from wrath through him.” The only way to escape the wrath of God against our sins is through faith in the blood of Jesus Christ. Colossians 1:20, “And, having made peace through the blood of his cross, by him to reconcile all things unto himself; by him, I say, whether they be things in earth, or things in heaven.” God still gets angry with His children (Psalms 6:1), but God's wrath does not abide upon us as it does upon the unbelieving who are still in their sins (John 3:36). God's wrath is temporary until we repent and get right with God (1st John 1:9). Christ-rejecting unbelievers will suffer greatly in eternity from God's stored-up wrath, that is just waiting to be unleashed (2nd Thessalonians 1:8-9). God is patient and long-suffering, waiting for all humanity to repent and be saved. But when God's time of grace and patience has ended, His mighty wrath will mercilessly execute eternal judgment upon those who do not repent. Psalms 50:22, “Now consider this, ye that forget God, lest I tear you in pieces, and there be none to deliver.” In sharp contrast, God's great wrath has been appeased, by the crucifixion of the perfect Lamb of God on the cross, and the sprinkling of the Lamb's blood upon the heavenly mercy seat. The righteous for the unrighteous (2nd Corinthians 5:21). God's anger upon the believer is only temporary (Isaiah 54:8; Psalms 103:9); but His wrath abideth continually upon the unbelieving wicked (John 3:36; Psalms 7:11). Yet, God does NOT hate the wicked. God still loves them even in His wrath. When the Bible says that God loved Jacob but hated Esau, it means that God hated Esau's rebellious ways, not Esau himself. My friend, if God casts you into the Lake of Fire one day, it will be done with regret, but He will still love you. You will be forgotten in Hell and die a miserable second death forever (Revelation 21:8). I know of unsaved people that have died in their sins and gone to Hell. I think about them from time-to-time and it breaks my heart, and I feel love for them. Do you think God is less righteous? I think not. God hates iniquity, and the sinner in the sense that God is not fond of them; but God unconditionally loves all humanity, which He Created, and for whom He gave His only begotten Son to die. How could God cease to love those whom He lovingly formed from the dust of the earth, those for whom He died, those for whom He made the universe? Evangelist Ray Comfort refutes the teaching that “God hates sin but loves the sinner.” He does so because of his Calvinistic views of salvation. Mr. Comfort disagrees with the notion that a person can merely believe on Christ to be saved, but continue living in gross immorality. According to Paul Washer, Ray Comfort, John MacArthur and many others, that person is not saved at all. Thus, in Mr. Comfort's plan of salvation, the only way to get God to love the sinner is for the sinner to believe on Christ and cease from intentional, deliberate, sinful living. Mr. Comfort errantly misunderstands this to mean repentance. Although this all may sound religiously noble, it is an utterly wrong. Pastor Bob Gray Sr. at the Longview Baptist Temple church in Longview, Texas, correctly preaches . . .
Eternal life is the free gift of God (Romans 5:15, 6:23; Ephesians 2:8-10). Christ was sacrificed on the cross as the sinless Lamb of God for our sins, and then He rose up three days later as our High Priest (Hebrews 4:15-16). Romans 8:34, “Who is he that condemneth? It is Christ that died, yea rather, that is risen again, who is even at the right hand of God, who also maketh intercession for us.” If Christ be not risen, then we have a sacrifice, but not a High Priest! Christ had to rise in order to enter into the heavenly Holy Place by His own blood (Hebrews 9:12) and sprinkle that blood (Hebrews 12:24) upon the mercy seat in the presence of God the Father (Hebrews 9:24). There are so many Scriptures that I can give you to prove that God loves all mankind (and since we're all sinners, that includes all of us). If you think about it, Scripturally, Ray Comfort's entire concept is flawed and utterly hypocritical. I have news for you, Ray Comfort is a sinner! Mr. Comfort sins every day, and so do I, and so do you! We are all sinners by nature and by choice! If God hates homosexuals, then He also hates gossippers, drunkards, those who don't pray, liars, cheats, hypocrites, mean people and bullies. Unless Mr. Comfort is sinless, then God would have to hate him too (according to his reasoning). I don't think that God hates Mr. Comfort. I love Mr. Comfort as a person, just as I love everybody, and so does the Lord. God is not fond of sinners, but He does love them at all times, which is why He gave His Son to die for them. John 3:16 has no expiration date as long as you're still alive. Once you die, then your time is up here on earth and your eternal fate is sealed, going to either Heaven or Hell. According to Ray Comfort's errant thinking, the basis for receiving God's love includes ceasing from sinful living. That is human effort, which is not permitted in the plan of salvation. You don't have to give up anything to be saved. God wants to give you something. The Word of God teaches that Christ's blood washes away our sins and appeases the wrath of God. Obtaining peace with God concerning salvation is solely based upon what Christ did for us, not upon what we can do for Him. Colossians 1:20, “And, having made peace through the blood of his cross, by him to reconcile all things unto himself; by him, I say, whether they be things in earth, or things in heaven.” If you are a believer living in unrepentant sin, God is displeased with you, but you are redeemed by Christ's blood nevertheless. The manner in which we choose to live as believers has absolutely nothing to do with the gift of eternal life, which is obtained through faith in the blood of the cross of Jesus. Disobedient believers will be chastised and scourged by their heavenly Father (Hebrews 12:6-8), and they will face the Lord's wrath at The Judgment Seat of Christ (2nd Corinthians 5:9-11). The Bible teaches that there is no greater love than to offer up one's life as a sacrifice for OTHERS. That's exactly what Jesus Christ did for all mankind on the cross. Jesus paid a debt that He did not owe, because we owed a debt that we could not pay. John 15:13, “Greater love hath no man than this, that a man lay down his life for his friends.” Some wayward preachers teach the Calvinistic heresy of “Limited Atonement,” which says that Jesus only died for Christians. That is a doctrine of devils. Jesus died for all mankind, each and every one. The following Scripture says that Jesus bought false prophets who deny Him. 2nd Peter 2:1, “But there were false prophets also among the people, even as there shall be false teachers among you, who privily shall bring in damnable heresies, even denying the Lord that bought them, and bring upon themselves swift destruction.” The Lord has bought all mankind (every man, woman and child) with His precious blood. Limited Atonement is a false doctrine. Jesus gave His life for all men. Obviously, you can see that if a person were to believe in Limited Atonement (i.e., that Christ only died for the sins of the saints), then it would also follow that God doesn't love the unbeliever for whom Jesus didn't die. What a horrible, lonely, unbiblical, heretical, teaching it is, to say that Christ only died selectively for certain people. What kind of love would that be? What if we acted that way toward others, saying, “I'll only give to you if you give to me?” Do you really think that God selfishly said in the beginning of time that He would only pay for the sins of those who receive Him? Here is Biblical proof that Christ died for all mankind. 1st John 3:16, “Hereby perceive we the love of God, because he laid down his life for us: and we ought to lay down our lives for the brethren.” The Bible says that we perceive God loves us by the realization that He laid down His life for us. So unless Christ died for all men, then all men cannot perceive the love of God for them. So if Christ only died for the saints, then how do we witness to the unbeliever? You cannot tell him that Christ died for his sins, because you don't know if he's going to get saved or not. Think about that! The entire idea of Christ only dying for certain people is insanely bad theology. How is the unsaved man supposed to feel loved, being told by a corrupted minister that God doesn't love him because of his sinful habits; and neither did Christ die on the cross for him, unless He gets saved? I'm so tired of Country-club theologians... us-four-and-no-more! Bless God, Jesus Christ died for everybody and “whosoever will” can be saved (Romans 10:13; Revelation 22:17)!!! If you want to be saved, you can be saved, right now, immediately, just by placing your total reliance in Christ's death on the cross for your sins, His burial and bodily resurrection three days later. The fact that the Bible teaches the greatest love is manifest by the greatest sacrifice can only mean that our great God gave the ultimate sacrifice of His only begotten Son to die on the cross for all humanity, as an expression of the greatest love for each and every individual throughout history. The heresy of Limited Atonement turns God into a used car sales con-man, a greedy thug who won't love you unless you love Him first. Jesus said in Matthew 5:44-48 that only the heathen think and act that way. The Bible teaches the exact opposite, that is, God loved us first (1st John 3:16). The Holy Bible proclaims the love of God for all humanity, by telling us in John 3:16, “For God so loved the world, that he gave his only begotten Son, that whosoever believeth in him should not perish, but have everlasting life.” The heresy of Selective (or Limited) Atonement robs men of the evidence that God unconditionally loves them. Romans 5:8 says that “WHILE WE WERE YET SINNERS, Christ died for us.” Some foolish Bible students claim that this Scripture only applies to Christians, but that would conflict with 1st John 3:16, which says we are able to perceive God's love by the sacrifice of Christ on the cross. If I were an unsaved person, I wouldn't feel loved at all to learn that Christ only died for Christians. In such a situation, I would have to first get saved to be loved by God. That goes 100% contrary to everything the Word of God teaches!!! Why would God teach us to love our enemies if He hates His enemies? God tells us to give to our enemies, feeding him if he is hungry, giving him a drink if he is thirsty, and helping him if he needs our help. Do you think God is any less righteous? I tell you, false theology will destroy your whole Christian character!!! I highly recommend that you not follow the teachings of the Westminster Confession, Martin Luther, John Calvin, Jacob Arminius or any of the other manmade creeds and belief systems. False Bible teachers have got everyone hating sinners nowadays! And beware of all the best-selling garbage theology on the bookshelves these days! 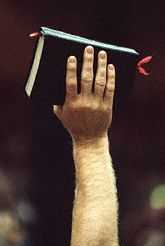 Just give me a King James Bible!!!!!!! The basis of those who say that God hates sinners is oftentimes a false understanding of the plan of salvation. This is caused in part by the modern corrupt Bible versions which pervert Scriptures like Romans 10:9 to teach Lordship Salvation. Also, John Calvin (1509-1564) still has many devout followers today 450 years after his death. John Calvin is considered the father of the Limited Atonement heresy, which Pastor John MacArthur also teaches, saying that Jesus only died for the sins of Christians. It is unbiblical! I think the problem is that a lot of preachers don't understand the Bible properly. They cannot grasp how God can unconditionally love (agape) a sinner, while at the same time not loving (phileo, a fondness) their sins. This is how God can love a person, but still hate their sins. I can unconditionally love a person with God's love, while still hating how they live or the heresies they teach. I may even admire them for some other qualities, agreeing to disagree on some points, and yet I refute their public wickedness if they run an abortion clinic, own a booze company or preach a false plan of salvation. I refuse to hate anybody! Life is too short to live with a burden of hatred. Love is a choice and I choose to love you and everybody else too!!! Believe it or not, Charles H. Spurgeon (one of the greatest Baptist preachers of the 19th century) was a one-point Calvinist and got caught up into the heresy of Limited Atonement (i.e., limited only to the saints). Limited Atonement is a lie. Jesus died for all humanity, which is what John 3:16 says (For God so loved THE WORLD). It is for these theological errors that some men are compelled to hate sinners. To say that God only loves Christians (or future Christians), and that He hates everybody else, is a doctrine of devils. You need to understand that Ray Comfort and John Macarthur, Paul Washer and Don Blackwell wrongly define “repentance” concerning salvation as: a change of mind that produces a change of lifestyle. That is not Biblical. Repentance is in fact, “a change of mind”; but the changes that genuine repentance produce CANNOT and SHOULD NOT be mandated for salvation. If I give you a birthday gift, you're likely going to feel gratitude and express it somehow. That's is proper, just so long as I don't expect it or require it. Because if I mandate that you return the gesture in response to receiving a gift, then it is no longer truly a gift. If I require you to express gratitude toward me for giving you a birthday gift, then it is not a gift. Not to mention that it would be ridiculous and unethical. Likewise, if God won't give you His gift of eternal life unless you forsake all, surrender to Christ's Lordship, forsake the world, cease from sinful bad habits and get dunked in a baptistry tub, then it cannot in any way be a gift.